Ok, I have to warn you this may be a slightly long blog post as I have done a million amazing things since the end of the Summer. I’ll keep it as brief as possible and use sub-titles so you can glance through and read what catches your interest. Ultimately, I can’t believe what we have achieved with so many cool people in our community – please accept a massive thank you and know that I am so inspired by your shared passion to reach out to young people from all walks of life and get them into coding. What an amazing day – went to a reception at the House of Lords with my parents to celebrate and promote the good work of the Diana Awards. It was so cool to be met by my local MP, Ellie Reeves, and to see some of the other award winners too. 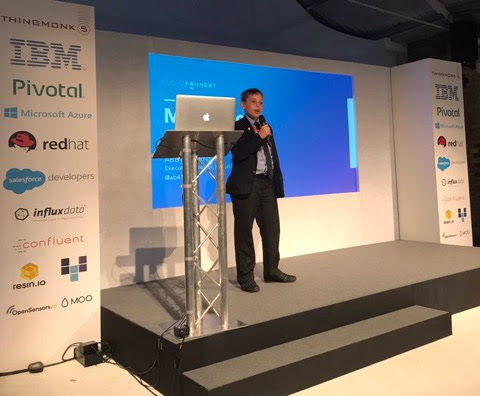 My work wasn’t over for the day, afterwards we headed for the Eclipse IoT ThingMonk2017 conference in Shoreditch as my mum wanted to introduce me to the awesome IoT community and can you believe it – I got asked to do an impromptu talk and it was great to get a standing ovation and fantastic tweets from everyone. A truly unforgettable day. My Inspiration bank got a real bonus. I went to the Barclay’s Bank in Canary Wharf to pick up my Diana Award and seeing all the other young people getting awards too. It was nice to hear about all the anti bullying work they are doing in their schools. Wayne Sleet presented all the awards alongside Tessy Ojo. On the Friday before half term, a film crew from NYC came and did some filming with me for Arm Technologies around our community work and the Micro:bit. As the first in a series of ‘Made Possible’ campaigns for ARM – that aims to raise awareness of the use of technology to better our future. I feel totally honoured and it was awesome to work with true professional. We had such a great time. Thanks to Hannah at @1000heads & Ben, Robbie & crew at @footagefilms. Thanks too, to the Microbit Foundation for always believing in our goals, however ambitious they are – especially Howard Baker, Gareth James and David Whale. Huge thanks to ARM for gifting some amazing tech gear. Our SLRJammers have enjoyed playing and creating new stuff with it (see 360 video clip). Here’s the final film. One of our biggest achievements of the year, apart from receiving a legacy Diana Award from Prince William and Prince Harry (see previous post) and running workshops for young people in Bangladesh, was linking up with Phoenix Community Housing who manage council housing in my own neighbourhood. As you may well know, we are big on inclusion and being able to reach out to kids who may not have opportunities to get excited about coding is a core aim for us. So for Phoenix’s Diversity Day I ran two workshops – a Crumble workshop and a Microbit one. It was the most amazing session – seeing neighbours banter whilst coding, three generations in a family help each other and a youth pairing up with an elderly person to crack the microbit. The venue was really cool and the Phoenix crew were really nice. Thank you. Looking forward to running another one, in February 2018. At last we delivered our 4th Jam in association with Phoenix Community Housing – our tickets where split between our regular Jam attendees and Phoenix’s own tenants. Running the day after the Diversity Day at the same venue, we knew it was going to be go to be amazing. We offered five different workshops and a range of drop in activities too. I ran my brand new Microbit Minecraft session – that was created with the technical wizardry of the great David Whale who coincidently has his second edition of Adventures in Minecraft with Martin O’Hanlon on sale from 30th November( great Christmas pressie). Thomas ran an amazing Neo Pixels and Microbit session with his dad and younger brother, Oscar. It was packed out and it got rave reviews from everyone. Cam and Amit ran the introduction to the Microbit session and really helped those who’d never coded or used a microbit before settle in. Val gave great technical support too. Nic ran the Microbit Robot challenge and did a fabulous job of cascading the art of coding robots with the Microbit. Steward ran his AR experimental Art session, Rachel ran a fabulous Wearables session, Marc & little Alex ran a Makey Makey corner, Tom showed us his latest inventions and Neil entertained everyone with his Soccer robots. Thanks to the whole crew. It wouldn’t be the same without Kano – who ran a Pixel session which, as always, was awesome. Microbit Foundation sponsored the event so that each child could be given a Microbit at the beginning and journey with them through two workshops and take them home to continue their exploration into coding. A huge thanks also to Pimoroni donated 20 sewable coin battery holders for our Wearables workshop and Rapid Online who donated 10 SD cards with NOOBS on. Another shoutout to PiTop who generously give an additional 10 PiTop CEEDS (wow) along with Frank and Val as backup on the day. Now this was such an amazing experience that it’s actually very difficult to express in mere words. I spent two days with the PwC Cyber-Security division – getting an unique introduction to Core Cyber Security, Threat and Vulnerability Management, Accessibly, Ethical Hacking ‘penners’, the Specialist Forensics team, and Crisis Management. I also ran a Microbit Robot challenge which I think went down well. There were so many really amazing aspects to Cyber Security that me and my mum learnt about and it has changed the way we use our own phones and computers. Now it’s actually quite hard to click any links as we know how easily malware can be downloaded through really sophisticated and individualised targeted phishing. Playing the ‘Game of Threats’ with Matt and Sophie – did get a bit competitive but that made it even more enjoyable. It’s hard to make decisions under pressure. In summary, we have a few quotes from our time at PwC. ‘Convenience is the enemy’ – from Sophie. When we use time-saving features such as autofill, fingerprint recognition and similar passwords for everything – this makes it easier for brute force attacks and hackers to access personal accounts. ‘You can secure software and hardware but the wetware (people) is the weak point’ – Paul. This means that you can have the most secure system in the world, however, if your employees are not cyber aware they can be the weakest point of entry, through phishing emails or poor password use. ‘A healthy dose of scepticism is always good to have’ – Jack. This relates to thinking about clicking on phishing email links. It was really nice to be able to give something back to the Cyber-security team by running a Micro:bit Robot Challenge using our Robo:bit buggies. It went down really well and we got really good feedback, especially when they formed groups to compete against each other. As I’m about to launch my business running corporate workshops, PwC’s offer to provide written feedback for a testimony is really generous. I’m also really looking forward to shadowing Alex and John, the company’s ethical hackers, at Christmas. I would like to send out a big, massive thank you to Richard Horne and his team for giving up their precious time in order to give me an awesome insight into cyber security. Richard is the senior Cyber Security partner at PwC and he was one of the judges at the inaugural Legacy Diana Award and liked all the work I’ve been doing in the community. They are actively involved in a mentoring programme with the Diana Award. A special thanks goes out to Katie and Maria who looked after us throughout our visit. I ran my second coding bootcamp over the half-term and although it was really hard work – it was a resounding success. Four out of six sessions sold out at the quirky Canvas and Cream cafe in Forest Hill. I ran two sessions a morning – a 5-7 yr old group and then a 8+ group over three mornings. I did Crumble Robot, Microbit and Minecraft workshops. To be honest, all the participants were what made it really cool and I was so impressed with everyone’s building and coding. Thanks to cafe owner, Owain, for making it all run smoothly. Another very special opportunity came up through the Diana Award. Chuck Stephens, head of Google:Diversity and Inclusion, also invited me and my mum for lunch and a tour around the very cool head quarters in Kings Cross. Kerry (Diversity Program manager) arranged for Joe and Ricard who are apprentices. In fact Joe knows us from when he worked at London CLC – we’ve done some joint work with coding and families in Lambeth. He talked to Femi about the team he’s been assigned to and the project he’s working on that provides the framework/template for search suggestion boxes. I didn’t realise it involved so much work. Ricard shared his journey into programming and about what he valued in life and in work. He gave some really awesome advice about computer programming and helped me to think about my own goals that will help me develop skills in relation to Cyber Security. Thanks so much Kerry, Joe and Ricard. I hope to be able to talk about some community projects with Chuck Stephens in the future. Our SLRJammer group are exploring VR, AR and our gear from Arm was tested out at UAL Chelsea College of Art. The Digital Maker Collective have been brilliant finding ways to collaborate with us and share their resources. A big thanks to Chris Follows and the UAL students. Thanks Josh for assisting us at MozFest. Here, we are preparing for MozFest. The team got our 360Fly camera working on Thursday – workshop due the following day. We discussed work flows and decided being real was the best approach. I got asked to do a speech at Mozfest this year. I was fine about it until the morning of it when I had to practice with the CEO of Mozilla. But I did ok, phew. Here’s a recording – its about 2 minutes long. Our session did actually go really well – we decided to share the beginning of our journey into 360 filming with participants – had a nice discussion and then filmed a short clip and posted it to YouTube. Young Thomas worked on short clips of him exploring the festival along with Stewart and Cam. Wow, I didn’t realise you can view 360 film on YouTube. We gained a new SLRJammer in Louis, who lives in South London and is really good with VR. Thanks Louis for all you efforts and we welcome you to our group. Link to clip coming shortly. I ran two Microbit Robot challenge workshops. They were really well attended and great fun. It was really nice to see the same MozFest friends as we always go to each other’s workshops. This year I ventured outside of the Youth Zone into the main festival – the Digital Inclusion zone. Thanks to Emrys and his team. The more relaxed set up was really much better. Thanks to Nic, Louis,Neill and everyone for helping out. Robot challenge, mentoring young Bangladeshi coders and picking up amazing swag. One of the biggest highlights of MozFest this year was being able to facilitate Roksana and Foyez coming over from Bangladesh. We all worked together there introducing over 200 disadvantaged young people to coding using the Microbit (see earlier post). They ran their Microbit Badge workshop that could detect when two microbit get out of range and set off an alarm. This was developed to raise awareness of the dangers due to flooding and children drowning. They did a great job and I really enjoyed taking them on a traditional swag hunt which is a nice way to network too. The Be4st ten80 group from Chicago really caught our interest and when they decided to join my workshop – I was delighted. They are amazing pre-college engineering students who have been wiping the floor in national STEM competitions. They have been working on RC cars using Arduinos . Anyway, both my mum and me really connected with them and when they said they wanted to learn more about the Microbit – we got into discussion and amazingly, we have found our next international project, hopefully bring the Microbit to their community. Oh no, may have to get fund-raising again. I think – another target to reach 100 young people in Chicago??? Finally, I’ve been given some guidance from Chris Richards at Think Rise, London to look at corporate branding and with the generous assistance of The Bunker – I have been given space at FinTech Connect Live in December to introduce my corporate workshops. With our SLRJammers, we’re going to attempt to gain 1000 subscribers on YouTube. Hopefully we’ll get some guidance from within the industry as we want to develop a three month strategic plan for our Social Media ambitions. That’s it for now – don’t forget to view the Made Possible video as I’m so proud of it and want to thanks everyone who made it possible!! !